Hooray! It’s spring! It’s the perfect time to bring some fresh and fun variations into your reading program. Do it the easy way without creating extra work. My motto is “There IS a life beyond teaching!” Here’s a promise not to give you more work to do! This article provides easy-to-implement ways to add springtime sparkle to reading time in classrooms everywhere. Are you in a book club? Isn’t it fun to get together with a bunch of friends who have read the same book? There’s nothing better than escaping for a few hours and indulging in deep discussions about books! (I LOVE my book club! However, I’m the first to admit that the deep discussions we have often don’t include the book!) Why not let your students experience the same kind of excitement? Here’s an easy way to have a whole class book club. Step away from your usual reading program for a few weeks and enjoy! Track down a class set of books that you know your students will love. 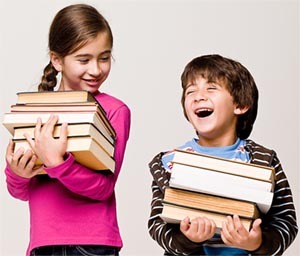 You may want to use bonus points from book orders to “purchase” a class set of books. Totally immerse your students in the experience! Now is the time to pull in everything you can within reason that ties in with the book. For example, a primary teacher might choose Frog and Toad Are Friends for the class book club book. Now is the time to learn about the life cycle of frogs during science, write Haiku poems about frogs, do some hands on math using frog counters and lily pads, and that cute frog art project you’ve always wanted to try! An upper grade teacher might choose Island of the Blue Dolphins. During Island of the Blue Dolphins book club, students learn about California history, make maps of the island, calculate how many miles Karana would have had to paddle to reach the mainland, and learn more about the animals that populated the island. Be sure to have children decorate the room to go with the book theme! Even your most reluctant readers will love this special time in your classroom! We bet you’ll enjoy the change of pace too! Can I do this WITH my students during school time instead of FOR my students using my out-of-school time? You can spend time after school writing sentences about a story on sentence strips for a sequencing activity. Or, you can elicit sentences about the story from your students and jot them on sentence strips as you discuss and sequence them. Start looking for opportunities to do more with your students instead of for your students. It’s a win-win situation! You have more time to pursue a life beyond teaching and your students are actively involved! Try this idea when you start a new read aloud chapter book. Before reading the first chapter, choose a student to be the chapter artist. When you’re about half way through the chapter, have the student begin working on an illustration to go with the chapter. Give the artist a few minutes to finish up the picture. Glue the picture on a piece of chart paper. Label the paper with the chapter number and chapter title. Elicit sentences about the chapter to write on the chart paper. Read the sentences to the class. Reread the sentences together. Use a new piece of chart paper for each chapter. At the end of the book, create a cover and title page and staple pages into a big book! Each day before reading a new chapter, take a few minutes to review and read the chart paper pages you have already created with your class. This instant review brings all of your students up to speed and gets them ready to hear the new chapter. Students who were absent know what is happening. It improves listening comprehension for the chapter they are about to hear. Keep track of your artists on a class list to make sure everyone get a turn. After reading and discussing the chapter, add information to each chart. Use different colored markers to record the information each day. The colors graphically show how characters and plots evolve and how predictions need to be revised as new information is revealed. With your students brainstorm a list of generic character traits such as adventurous, angry, brave, caring, gentle, curious, sad, thoughtful, happy, fearful, silly, shy, friendly, mean. Jot each trait in bold print on a word card. Distribute the cards to your students. Students place the trait cards on the chalkledge under the correct headings. After all of the cards have been placed, pick up the cards and read them aloud. Ask students to share specific examples that illustrate each of the characters traits. Students love this activity, it works with any book and there are no papers to mark!